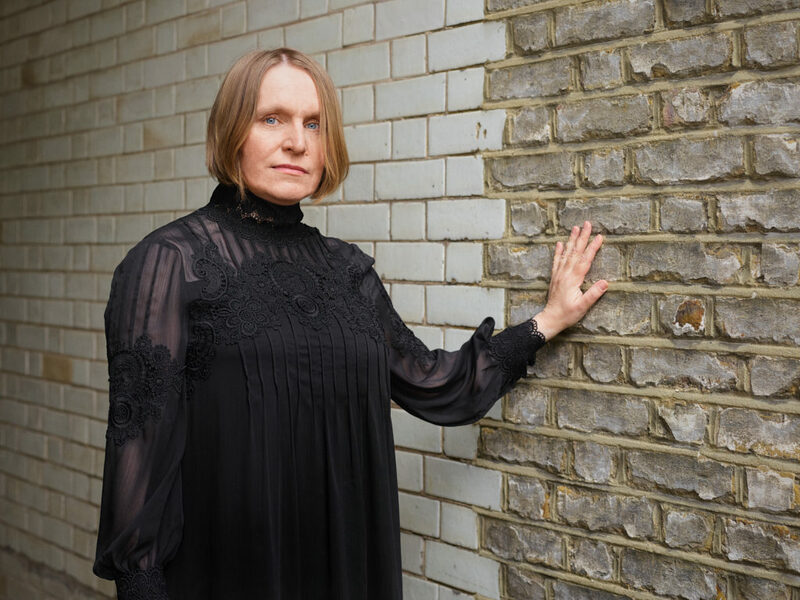 London-based composer, performer and robotic artist Sarah Angliss (born 1966) aims to create music that gets under the skin. Her highly inventive music combines different aspects of ancient and modern culture to uncanny and disquieting effect. Thematically, she’s inspired by the meeting point of machines and mysticism – the crackle of the galvanic in the telephone wire. With a Masters degree in biologically-inspired robotics (2006), Angliss creates her own musical automata – machines she combines with acoustic instruments, theremin, electronics, and field recordings in her compositions. Her robotic, polyphonic carillon, for example, plays at inhuman speeds, creating sound with an uncanny physical presence as it’s conjured by a machine on stage. Angliss mixes robotics with notated music and patches devised in Max, a compositional tool she uses extensively. Her compositions reflect an eclectic range of influences, from baroque chamber music and the English folk canon to the work of the pioneering BBC Radiophonic Workshop. Thematically, she’s also drawn to contemporary expressions of ancient English folklore in the city. This was the subject of Ealing Feeder (2017), an album steeped with the sounds of sirens, wrestling rings, the Thames and the London tree canopy. A prolific live performer, Angliss also applies her unusual sonic techniques to theatre. Her underscore for The Hairy Ape, Eugene O’Neill’s 1926 play about the shock of modernity, played in The Old Vic, London, and Park Avenue Armory, New York. It’s an honour to receive a Paul Hamlyn Award. I’m so grateful to the Foundation and judges for their generosity and encouragement. This award is transformative, giving me time and funds to think more expansively about my music and explore ideas I’ve been incubating for some time. With it, I can compose for larger ensembles (human and robotic) and progress further with the electroacoustic chamber opera Giant. I can also engage in some open-ended experimentation, exploring new forms of sound-rich theatre. Above all, this award reassures me I can trust my musical instincts, a gift that’s invaluable. Theremin, field recordings, percussion (Stephen Hiscock) and spoken word (Colin Uttley). Recording from the album ‘Ealing Feeder’ released in 2017. Spinet, theremin and robotic carillon. Voice (David Bramwell), recorder, nails and pins electronically processed. Voices (in order of appearance: Jonathan Gunthorpe, Sarah Gabriel and Melanie Pappenheim), viola (Stephen Bentley-Klein), viola da gamba (Emilia Benjamin), percussion (Stephen Hiscock), words Ross Sutherland, harmonium and Max. Opera co-devised with director Sarah Fahie. Recorded at Snape Maltings and London Bubble, 2018.